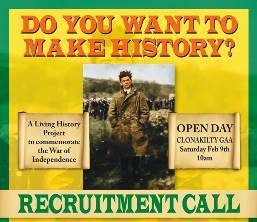 Award-winning documentary production company Abú Media is looking to recruit a dozen men from the West Cork area to take part in a living history project to commemorate the War of Independence. The project will result in a major new TV series – The Brigade – on RTÉ1. The twelve recruits will reform a Flying Column from 1920. They will be trained by ex-Irish Army officers for a week in a boot camp, and then take part in reconstructions of key battles from the War of Independence. They will be expected to drill, learn to shoot, and live as if 'on the run', so while this will be exciting opportunity for many, it won't be a cosy doddle! An open recruitment day will be held at Clonakilty GAA grounds on Saturday 9 February from 10am. Filming will take place from 13–20 February. Personal details: name, address, age, occupation, contact information. Motivation: Say why you want to be part of The Brigade, and whether you have any connection with the old Brigade.